Would you like to view a library of fabrics? We have included the links to some of our favourite fabric dealers so that you can view fabrics and patterns at home. While these websites are fun to browse, please feel free to book a consultation so that you can view the actual fabric samples in your own home. Drapery hardware is like jewellery for your windows. You’re not stuck with boring curtain rods any more. 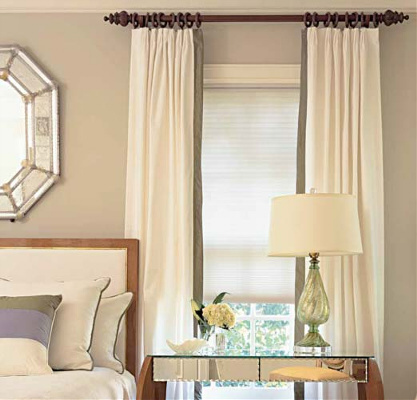 There’s a look in drapery hardware that can dress up any room in any style. About 20 years ago, someone realized that draperies could be enhanced and beautified with interesting rods, rings, and tiebacks. The window covering industry will never be the same! Drapery hardware became a focal point of window dressing. Kirsch is one of our favourite hardware dealers and we have included their website link for you to browse.